May 25, 2012 by Mr.
As a Surrey resident and SFU grad, I’ve walked by Central City Brewing Company countless times. It’s a wonder why I never sat down, and tried their beers. So on a chilly Friday afternoon, I visited CCBC for a quick drink. They had a Beer Flight available on the menu. You can have four 5oz glasses for only 6 bucks—a great deal considering a 20oz pint is $5.80. 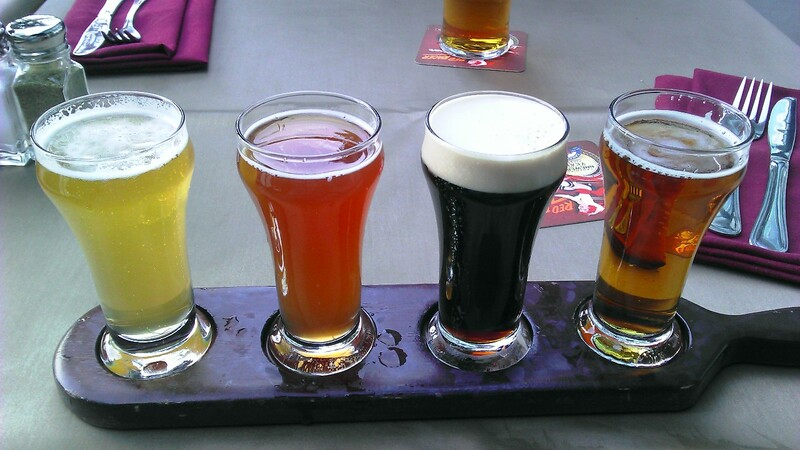 From left to right, they are Red Racer Classic White Ale, Red Racer Raspberry Wheat Ale, Red Racer Nitrogen stout, and Red Racer IPA. 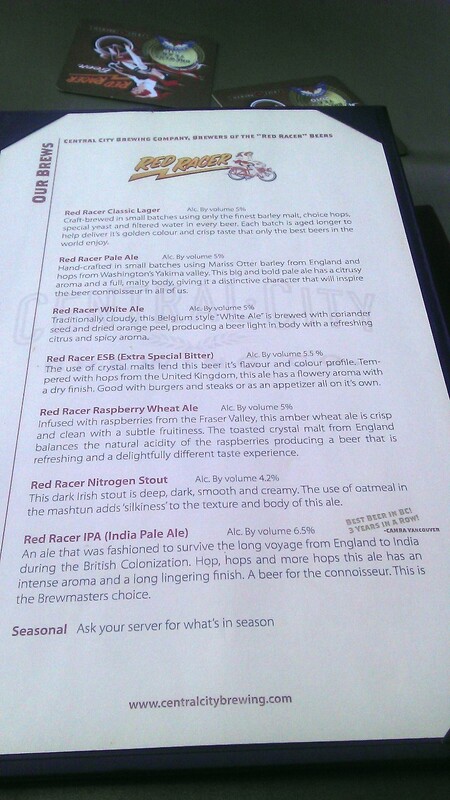 If you’re looking for an easy drinking beer, I would go with the Raspberry Wheat Ale. It’s not a thick ale, and the light acidity of the raspberries offsets its wheat-iness nicely. It’s great all year round. The white ale is a clean beer with a slight citrus taste. The flavours are not over powering. I think It’d go great with light dishes or on its own. I also enjoyed the Nitrogen Stout. It’s dark, bitter, and very smooth. There’s a hint of dark chocolate in the after taste as well. It would be great with a nice meaty stew, or any sort of savory comfort food. The IPA is definitely not for beer amatures. It’s very hoppy with a strong bitter after taste. I have not grown to appreciate IPAs just yet, so this is probably my least favorite choice. Overall this is a very polished brewery and pub, not at all what you’d expect in Surrey. Not to mention the beers are excellent. Go give them a try.